Tim Clarke was among the goal scorers as Crackenedge defeated Ryhill in the Jim Callaghan Cup quarter-final. 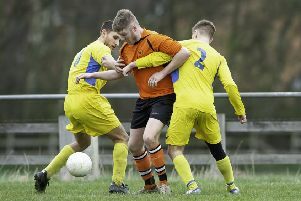 Fox and Hounds caused a huge stir in the Wakefield League Premier Division as they defeated leaders Crofton Sports 4-3. Fox and Hounds started the day bottom of the table but victory was enough to lift them above Beechwood Santos, while handing neighbours Crackenedge a huge favour in the title race. Fox and Hounds led 3-0 at half-time and secured their third win of the season as Thomas Ramsden bagged a brace, while Declan Bickers and George Porter also netted. Crofton replied through Oliver Applebee and Benjamin McAdam but defeat leaves them just a point above Crackenedge having played three games more. Crackenedge marched into the Jim Callaghan Cup semi-finals and remain in the hunt for five trophies after they defeated Ryhill 6-1. Adam Williams bagged a hat-trick, while Tim Clarke, Scott Lightowler and Macauley Parkinson also netted. Crackenedge face a trip to Hartshead in the Heavy Woollen District FA Wheatley Cup on Saturday, when Fox and Hounds visit Beck Lane to take on holders Littletown. Overthorpe Sports are fifth in the Premier Division after battling out a 4-4 draw away to Snydale Athletic. Howden Clough moved eight points clear at the top of Division Two following a 3-1 win over Thornhill United, with all the goals coming in the first half. Jack Anderson bagged a brace and Joseph Hampshaw also netted as Clough picked up their 12th win in 14 league outings. Clough extended their lead over Pontefract Town after they suffered a 3-1 defeat away to Dewsbury Westside. Irfan Ali, Zubair Hussain and Jamil Sair struck for Westside, who remain fourth but are now just a point behind Great Preston and Pontefract, who are joint second. Westside will also bid to reach the League Cup semi-finals this Saturday when they visit Thornhill United, while Clough face a trip to Snydale Athletic Reserves. Overthorpe Reserves remain bottom of the table following a 1-0 defeat to New Carlton.